There is lots to like about Silver Sands Beach Hotel. It’s easy to access one of the best beaches in Cyprus, Sunrise Beach, the abundance of great restaurants serving amazing food and its location on the relatively quieter part of Cyprus, in Protaras, whilst handily located near conveniences. A taxi ride from Larnaca International Airport will take about an hour. Guests will be able to make it down to Sunrise Beach in no time and other beaches are located nearby along this side of the Cypriot coast. Silver Sands Beach Hotel has several of its own restaurants and bars as well as there being restaurants that accommodate a range of international tastes through a sampling of traditional Mediterranean cuisine is recommended whether at the hotel or a taverna. 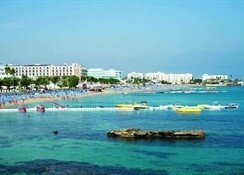 Attractions include the Ocean Aquarium, Cape Greco national Forest and the Magic Dancing Waters Show. Silver Sands Beach Hotel can be found in the heart of the beautiful region of Protaras and can be reached from the nearest airport, Larnaca International Airport, in about an hour, as it is about 65km away. 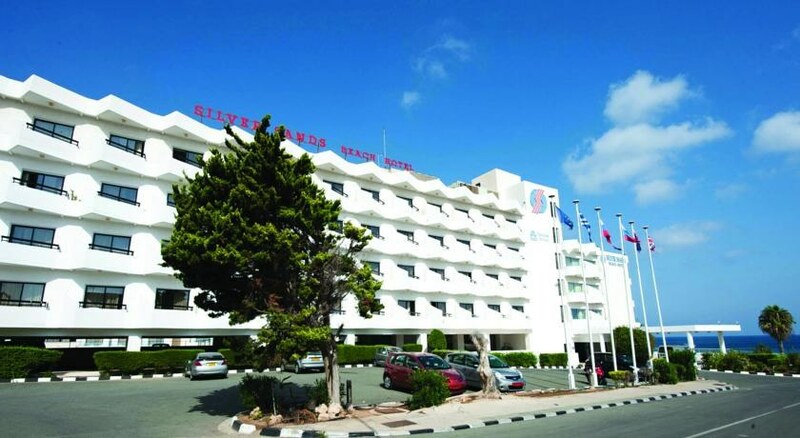 Silver Sands Beach Hotel sits on the beachfront, making getting down just an easy stroll. The main road of Protara sits just behind the hotel and provides easy access to an array of fantastic restaurants. Food shopping can be had at two nearby supermarkets whilst further conveniences can be reached with a five-minute taxi ride north. Family fun attractions such as mini golf and the aquarium are all within a two-mile radius. Rooms at Silver Sands Beach Hotel are tastefully decorated and light and airy in keeping with the Cypriot way. Rooms are fully furnished and typically sleep two adults, but family rooms may sleep up to four guests and these are typically more spacious. There are all the basic amenities you would expect from a great hotel such as air-conditioning, telephone, safe deposit box, tea and coffee facilities, T.V. and more besides. You’ll have access to a private balcony that will either overlook the hotel gardens, the street or the Mediterranean Sea. Dining at Silver Sands Beach Hotel means having the enjoyable task of selecting from one of the fine restaurants or bars. There are themed buffet nights at each of the restaurants which cater to international tastes as well as serving authentic local Mediterranean dishes. The All-Inclusive package includes breakfast, lunch, dinner and snacks between meals as well as alcoholic and non-alcoholic drinks. The hotel’s location makes dining out a breeze with plenty of fine choices available. These include tastes of traditional Greek/Cypriot cuisine at Andama Tavern, fine Italian at Promises Restaurant and fresh Mediterranean seafood at Poseidonio. 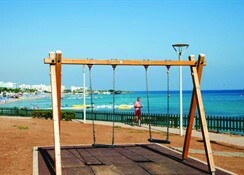 Fun for all the family can be had at Ocean Aquarium or wander down to Sunrise Beach, which has a reputation for being one of the finest in Cyprus. Though famed for its beaches, a trip to Cape Greco National Forest allows you to soak in a different kind of natural Cypriot beauty. Hire a bike and cycle or simply go for a walking saunter through this little haven. Back at Silver Sands Beach Hotel, there’s plenty to keep guests happy with. 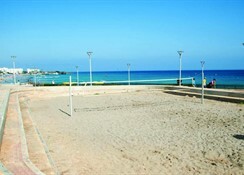 Such activities range from the outdoor swimming pool and sun terrace to squash and beach-volleyball. In addition, there is a seasonal entertainment programme which includes live dancing and music as well as special children’s shows. good hotel, work around area at time.